Engineers need to be able to test the flammability of the materials they use in buildings and other structures. However, the range of test procedures and regulations in this important area is often confusing. Flammability testing of materials used in construction, transport and mining provides an authoritative guide to current best practice in ensuring safe design. The book begins by defining flammability and the main types of test available. Building on this foundation, a group of chapters then reviews tests for key materials used in buildings and their contents. There are chapters on wood, external cladding and sandwich panels as well as the flammability of walls and ceilings. Tests for furniture fabrics, cables and electrical appliances are also reviewed. 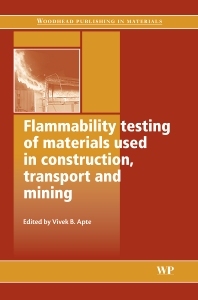 A final group of chapters discusses other types of test, particularly in the transport sector, including chapters on flammability testing for railway passenger cars, aircraft, road and rail tunnels. With its distinguished international team of contributors, Flammability testing of materials used in construction, transport and mining is a standard reference for civil and transport engineers in particular. Understanding materials flammability; Fundamental measurement techniques. Part 1 Flammability tests for buildings and their contents: Flammability of wood products; Flammability tests for external cladding on buildings; Fire hazard assessment of wall and ceiling fire spread in rooms; Fire behaviour of sandwich panels; Flammability tests for upholstered furniture and mattresses; Flammability tests for cables; Flammability tests for electrical appliances. Part 2 Flammability tests for transportation and mining: Flammability tests for regulation of building and construction materials; Fire testing in road and railway tunnels; Flammability tests for aircraft; Flammability testing in the mining sector; Flammability tests for railway passenger cars; Ships and submarines; Tests for spontaneous ignition of solid materials. Dr Vivek Apte is a Senior Research Scientist with CSIRO Manufacturing and Infrastructure Technology (CMIT), and has led a number of projects within its Fire Science and Technology Laboratory. Before joining CMIT, Dr Apte was a Senior Specialist at TestSafe Australia for 14 years. He is the author of over 75 publications in the area of fire and explosion safety.